S. I. Bailey discovered asteroid #504 Cora. Albert Einstein submitted his article "On the Electrodynamics of Moving Bodies" for publication in which he introduced special relativity. A large aerial explosion occured at 60deg55′N, 101deg57′E, near Tunguska, Siberia, presumably due to small asteroid or comet. The size of the blast was later estimated to be between 10 and 15 megatons. At around 7:15 AM (local time) on 30 June 1908, Tungus natives and Russian settlers in the hills northwest of Lake Baikal observed a huge fireball moving across the sky, nearly as bright as the Sun. A few minutes later, there was a flash that lit up half of the sky, followed by a shock wave that knocked people off their feet and broke windows up to 650 km (400 mi) away. The explosion registered on seismic stations across Eurasia, and produced fluctuations in atmospheric pressure strong enough to be detected by the recently invented barographs in Britain. Over the next few weeks, night skies over Europe and western Russia glowed brightly enough for people to read by. In the United States, the Smithsonian Astrophysical Observatory and the Mount Wilson Observatory observed a decrease in atmospheric transparency that lasted for several months. C. Jackson discovered asteroid #1784 Benguella. Lee De Forest (26 August 1873 - 30 June 1961) was an American inventor with over 180 patents to his name, the self-described "Father of Radio", and a pioneer in the development of sound-on-film recording used for motion pictures. De Forest invented the three-element "grid Audion", a vacuum tube that takes weak electrical signals and amplifies them. De Forest is generally recognized as one of the fathers of the "electronic age," as the Audion helped to usher in the widespread use of electronics. NASA launched the Explorer S55 micrometeorite counter satellite from Wallops Island, Virginia, on a Scout X-1 rocket which failed when the third stage did not ignite, and the vehicle was destroyed. USSR launched Cosmos 6 (also called Sputnik 16), a Soviet DS type military satellite. Cosmos 6, launched 30 June 1962, was a Soviet DS (Dnepropetrovsk Sputnik) type military satellite launched from Kapustin Yar. The DS spacecraft were small satellites built by Yangel's OKB-586 / KB Yuzhnoye in the Ukraine for launch by the same KB's Kosmos launch vehicles. They were used for a wide range of military, scientific research, and component proving tests. NASA launched Atlas Centaur AC-3, which was to have put its payload into geosynchronous transfer orbit, but instead suffered a hydraulics failure and only reached an apogee of 500 km. NASA and the US Air Force launched X-15A Optical Degradation/Alternate Build Technology test mission # 110 in which John McKay reached a maximum speed of 5366 kph (Mach 4.96) and a maximum altitude of 30.358 km. NASA's Langley Research Center put its Apollo Lunar Landing Research Facility into operation. NASA's Langley Research Center put its $3.5 million Apollo Lunar Landing Research Facility into operation on 30 June 1965. The huge structure (76.2 m (250 ft) high and 121.9 m (400 ft) long) was used to explore techniques and to forecast various problems of landing on the Moon. The facility enabled a test vehicle to be operated under one-sixth g (vehicle vertical) conditions. T. Smirnova discovered asteroid #2139 Makharadze. USSR launched Intercosmos 7 from Kapustin Yar for continuation of joint studies of the Sun's ultra-violet and x-radiation, and its effects on the structure of the Earth's upper atmosphere. USSR launched the Meteor 1-12 weather satellite from Plesetsk for acquisition of meteorological information needed for use by the weather service. Observers aboard a prototype of the Concorde supersonic transport observed a total solar eclipse for over 74 minutes by flying along the path of the Moon's shadow at nearly 1300 mph as it traversed the Earth. Intelsat 5A F-11 was launched from Cape Canaveral, Florida, positioned in geosynchronous orbit at 27 deg W 1985-1990; 63 deg E 1990-1992; 177 deg E 1992-1994; 180 deg E 1994-1997; 29 deg W 1998-1999. During the unrehearsed 5h 10m Mir EO-3-2 EVA, cosmonauts Vladimir Titov and Musa Manarov began repair of the TTM telescope but were thwarted by complications and tool failures. Russia launched Progress M-13 from Baikonur to Mir. Progress M-13 was launched 30 June 1992 as an unmanned resupply vessel to Mir. An initial docking attempt on 2 July 1992 was a failure. Progress M-13 docked with Mir on 4 July 1992 16:55:13 GMT, undocked on 24 July 1992 04:14:00 GMT, and was destroyed in reentry on 24 July 1992 08:03:35 GMT. Total free-flight time 4.17 days. Total docked time 19.47 days. It was docked to Mir for only a few weeks, since on 26 July, Soyuz TM-15 was to be launched with a replacement crew and would need to use the same docking port. Russian Premier Boris Yeltsin cancelled the Buran project, which had no known mission (because of the end of SDI and the Cold War) - plus the project manager was one of the 1991 coup plotters. It had cost 20 billion rubles at the time of cancellation. Ron Howard's cinematic version of the Apollo 13 mission was released. The film grossed US$ 334.1 million worldwide, and reawakened popular awareness of and interest in the space race of the 1960s. NASA launched the TDRS 8 communications satellite from Cape Canaveral, Florida. TDRS 8 (TDRS-H), launched 30 June 2000, was the first Advanced Tracking and Data Relay Satellite built using a Hughes HS 601 satellite bus. It included an S-band phased array antenna and two Ku/Ka band reflectors 4.6 meters in diameter. The satellite achieved a 167 x 577 km x 28.3 deg parking orbit at 13:05 GMT. The Centaur upper stage made a second burn at 13:21 GMT, releasing the satellite into a subsynchronous transfer orbit of 237 x 27,666 km x 27.0 deg. The satellite's own Primex/Marquardt R4D liquid apogee engine was then used to maneuver the satellite into its final geosynchronous orbit. It was positioned in geosynchronous orbit at 150 deg W in 2000. As of 5 September 2001, it was at 149.99 deg W drifting at 0.014 deg E per day. The Sirius 1 commercial direct broadcast satellite was launched from Baikonur on a Proton rocket to broadcast to consumers in the US. Sirius 1 was launched 30 June 2000, a commercial Digital Audio Radio Satellite, used for transmission of S-band radio broadcasts direct to receivers in cars in the United States. Sirius 1 was inserted into an initial 6166 x 47110 km x 63.4 deg transfer orbit by the Proton-K's Blok DM3 upper stage. The satellite's R4D liquid apogee engine made several burns to raise the orbit to 24388 x 47097 km x 63.3 deg by 8 July. The elliptical, inclined 24 hour orbit had a 24 hour period designed to keep the satellite between longitude 60W and 140W, with its apogee over the northern hemisphere. It was positioned in geosynchronous orbit at 66 deg W in 2000, and as of 6 September 2001, it was at 65.59 deg W drifting at 0.015 deg E per day. 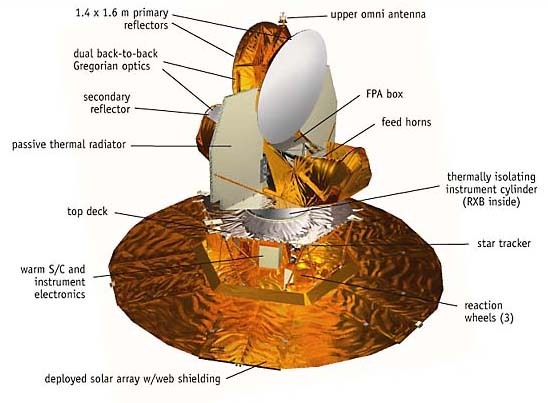 NASA launched the Wilkinson Microwave Anisotropy Probe (WMAP) to study cosmic microwave background radiation. The Wilkinson Microwave Anisotropy Probe (WMAP), launched 30 June 2001, was placed in a 167 x 204 km x 28.8 deg parking orbit at 1958 GMT. At 2104 GMT the second stage was reignited for a 4 second burn, raising the orbit to around 181 x 308 km; the third stage spun up and ignited at 2108 GMT, accelerating WMAP to a highly elliptical orbit of 182 x 292,492 km x 28.7 deg. WMAP used on-board fuel to tweak the orbit. By 22 July, WMAP was in a 4055 x 355,935 km x 28.0 deg orbit. It flew past the Moon at the fourth apogee at 30 July 1639 GMT at an altitude of 5200 km above the Lunar surface. It arrived at the L2 Earth-Sun Lagrangian point 1.5 million km from Earth three months later, on 1 October 2001. From L2, WMAP measured fluctuations in the cosmic 3 Kelvin microwave background with the degree of precision required to answer questions about the Big Bang and the total mass and fate of the universe. WMAP ended the collection of science data on 19 August 2010, with full analysis of the data complete and publications submitted as of 20 December 2012. A Rokot booster was launched from Plestesk carrying an international payload of 8 satellites to orbit. * Czech Republic Mimosa, a 65 kg polyhedron built by Space Devices Ltd. of Praha, and operated by the Astronomical Insitute of the Czech Academy of Sciences (Astronomicky ustav AV CR). It carried an accelerometer to study atmospheric density. * Denmark DTUSAT technology cubesat. The Danish cubesat DTUSat remained silent after release despite several attempts to contact it. It carried a 450-meter copper wire tether for lowering the satellite orbit. * MOST (Microvariability and Oscillations of Stars) was a Canadian Space Agency project with a 0.15 m telescope which would make photometric observations of stars down to magnitude 6 with 1 part per million accuracy in the 3500-7000 Angstrom band. * Japan Cute-1, built by the Tokyo Institute of Technology, carried engineering test equipment. * US Stanford University/Quakesat LLC Quakesat was to be used for detection of ELF radio emissions from seismic activity. * Denmark AAU Cubesat, Aalborg University successfully contacted its AAU-Cubesat nanosatellite after it was separated. It carried a 100 meter resolution Earth imaging camera. * Canada CanX-1, from the University of Toronto, carried a camera for attitude determination. * Japan CubeSat XI-IV carried technology tests for the University of Tokyo. In addition, the Russian MONITOR-E/Breeze mockup of a MONITOR-E(arth) satellite remained unseparated from the Breeze-KM upper stage. The ESA/NASA Ulysses solar exploration probe was commanded to turn off its transmitter, ending its mission.